So, in the UK November 5th is the day we um….celebrate a plot to blow up Parliament and the King in 1605, by lighting fireworks and standing outside in the dark eating jacket potatoes and declaring that burgers cooked on a bonfire are the best food you’ve ever eaten…even when you are a vegetarian like me! 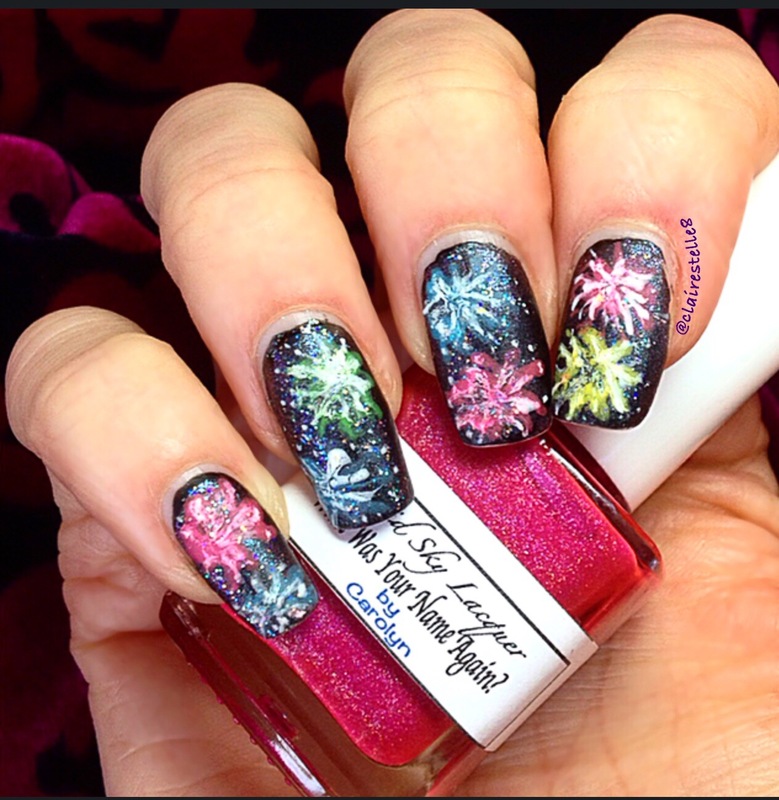 We have some very unusual traditions here but Guy Fawkes or Firework Night is great fun so I decided to celebrate with a firework inspired mani! I started with a base of Models Own Purple Blue and free handed some fireworks with Liquid Sky Lacquer polishes in What Was Your Name Again ( a vibrant holo pink). Swerve ( a stunning holo teal) and Turn Up ( a zingy bright holo green) and Nails Inc Sumner Place( a lemon yellow). I then topped it with dashes of Models Own White Light. 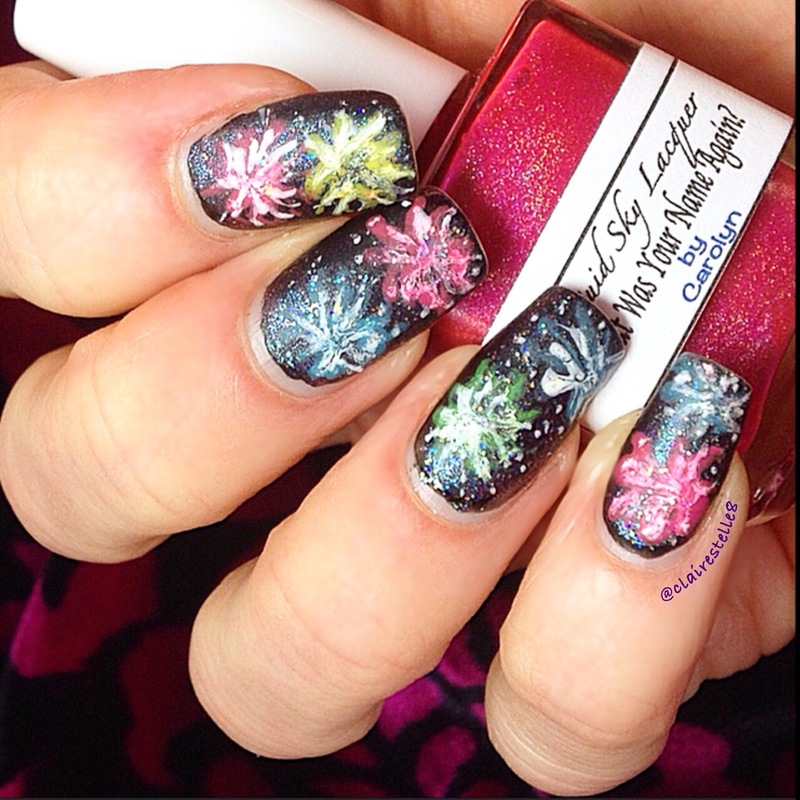 I had great fun doing this design and am looking forward to all the fireworks…and potatoes tonight! How are you celebrating? Models Own can be purchased at selected Superdrug stores and look to their website at http://www.modelsownit.com/ and IG http://instagram.com/modelsownofficial for info on buying internationally. Liquid Sky Lacquer shop is currently closed but check their IG at http://instagram.com/whimsicalcolor for all the latest news on new collections and store reopening.